In this week’s episode of Mad Genius Tips, F&W’s Justin Chapple demonstrates how to make one of Gail Simmons’s favorite healthy desserts: frozen yogurt dots. They’re supereasy to make and fun to eat. But they’re not the only way to use yogurt in good-for-you desserts. Here, eight recipes to try. 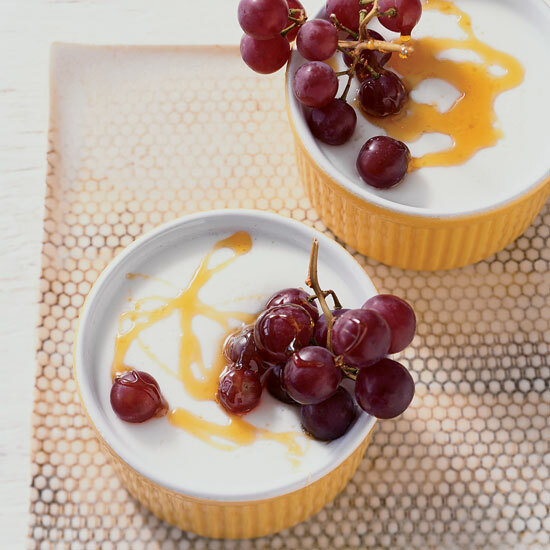 Thick and creamy Greek-style yogurt makes for a delicious base in these tangy, low-fat panna cottas. Healthy oats and almonds are incorporated here in an ingenious granola crust for this sweet-tart pie. This dessert is luxuriously creamy, yet still low in fat and calories. Chamomile and lavender have calming properties. Here, the flowers are steeped in a syrup for antioxidant-rich berries. Michael Laiskonis likes the retro charm of melon balls: He marinates them in lime and ginger, and matches them with vanilla granita and a light, citrusy yogurt cream. This stunning, make-ahead frozen treat, made with fat-free yogurt, fresh fruit and turbinado sugar, is delightfully creamy. These airy soufflés have a terrifically tangy flavor thanks to fresh red currants.